Posted February 7, 2014, in Student Alumni. 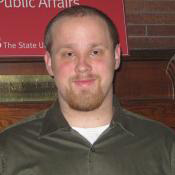 Pierce Hacking is a graduate of the Honors College at Rutgers–Camden and was enrolled in the BA/MA dual degree program in Criminal Justice. He also completed a minor in Sociology and was an active member of the campus’s Criminal Justice Organization. He was a Project Assistant primarily working on Municipal Juvenile Delinquency Prevention. Page last updated by Senator Walter Rand Institute for Public Affairs at 3:16 pm August 31, 2016 . This page was printed from http://rand.camden.rutgers.edu/2014/02/07/hacking-pierce/ at 8:30 PM Saturday, April 20, 2019.